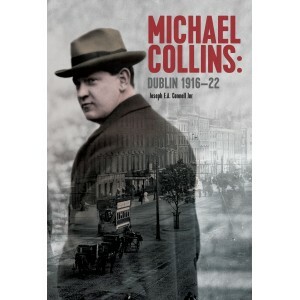 The story of Michael Collins in Dublin is the story of Irish nationalism and separatism from 1916 until 1922. Collins’s footprint was on every street, laneway and alley of Dublin, but especially of Dublin 1. This is the story of those locations, as well as of the men and women associated with Collins in Ireland’s capital city from the time of the Rising until his untimely death in 1922. It is unknown whether Collins spent more than a night in Dublin prior to leaving for London to work in the British Post Office in 1906, but his presence there seemed ubiquitous from 1916 to 1922. He is widely remembered today for the significant role he played during the War of Independence of 1919–21. As director of intelligence, president of the IRB and minister for finance, he established several offices and safe houses throughout the city. It was said that he never slept in the same house two nights in a row after going on the run in April 1918 until the Truce in July 1921. Truly, Collins made Dublin his own. He once famously said that ‘Whoever controls Dublin controls Ireland’. He was right. The streets of Dublin are paved with stories. A good way to build one’s knowledge of Michael Collins is to walk in his footsteps and, in so doing, relive those stories and gain an understanding of this difficult period in Irish history—and, indeed, of this enigmatic yet iconic figure. With this book the reader can do just that. Joseph E.A. Connell Jnr is the author of Dublin Rising 1916 and Who’s who in the Dublin Rising 1916, published in 2016 by Wordwell. He writes a regular column in History Ireland and is a regular contributor to Newstalk’s Talking History programme.